After falling in love with Val d'Anniviers during our two summer visits in 2014 we have so many incredible memories to look back on. Alongside being a hiking wonderland, the valley offers so many other places to visit and things to do that we wanted to put together a list of some of our favourites. Whether you plan to visit Switzerland for a few days or a few weeks, the list below provides some excellent reasons to pay a visit to this remarkable valley. Also, don't forget to check out the latest information on the Val d'Anniviers Liberte Pass. During our time here in 2014, for the tiny tourist tax of just 2.50CHF per person, per day we both received a Liberte card that gave us free use of all buses and free access to almost all cable cars and ski lifts (and discount on the rest). In addition the pass also gave free (or heavily discounted) access to many activities throughout the valley such as the new indoor swimming pool in Zinal, mini-golf, tennis etc as well as free access to several museums and places to visit such as the Francois Xavier Bagnoud Observatory! It was the Liberte Pass that convinced us to stay more than just a few days and allowed us to really explore what this stunning valley had to offer. We reckon we made use of over £400 of activities during our two visits in June and September (25 days in total). Hiking is always going to be top of our own list of activities in a stunning mountain location like this. But with almost 500km of trails to suit all abilities, from strenuous ascents to gentle strolls, getting out on the well marked paths of Val d'Anniviers is a must for any visitor who wants to connect with nature and experience the peace and tranquility of the area. Although this year we didn't try any, there are also many trail options marked suitable for mountain biking and bikes can be taken up on most of the cable cars. Although it's only one item on our list, we actually spent around half of our time in Val d'Anniviers hiking. The local tourist offices are a great resource for trail ideas. We've also added a list of our own 5 favourite hikes here, or you can see all of our hikes here. The main villages of Val d'Anniviers are Vissoie, St-Luc, Ayer, Grimentz, Zinal, and Chandolin. Each has its own beauty, but for us Grimentz with its sun-blackened traditional houses decked in blooming red geraniums had a particular rustic charm that we never tired of. Whichever village you stay in, a visit to Grimentz simply to stroll through the old town, soaking up the atmosphere and gazing out over the surrounding hills is a great experience. Val d'Anniviers has a great selection of cable cars to take visitors high onto the surrounding hills, either to look over the valley and have a drink in the cafes or to get a headstart on a hike into the higher peaks. The cable cars from Grimentz to Bendolla, from Zinal to ski station Sorebois and the chair lifttp Tsape from Chandolin are all beautiful. However, if you only ride one cable car we'd recommend taking the ride from Grimentz to Corne de Sorebois. We preferred to hike to the Corne, but it was clear from watching the car swinging out over the gaping valley and rising up to 2896m (the highest car in the valley) that this was a spectacular treat for the passengers. 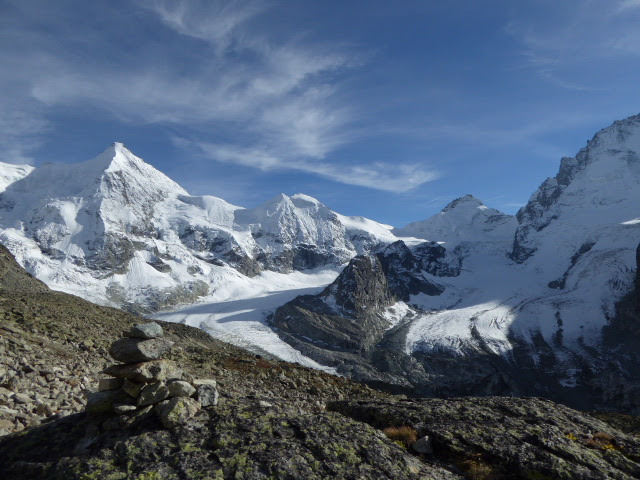 The view from the Corne was one of the greatest outlooks in the whole area, including sweeping views along the whole Val d'Anniviers and the five 4000m peaks at the crown of the Zinaltal. Funicular railways in the Swiss Alps are a novel and exciting way to get around and this one, which rises steeply up over 400m of mountainside, is especially fun. With great views over to the western side of the valley, the station at Tignousa has a cafe and is a great base for starting out on hikes or visiting the observatory nearby. A couple of hundred metres from the Tignousa station, this is the highest observatory in Switzerland dedicated entirely to public engagement. The FXB observatory offers daytime sun flare shows and nightime stargazing as well. We went to both and found them to be both informative and great fun, learning lots about the sun, star constellations and galaxy clusters. Both started with a short presentation, followed by a trip onto the roof to look through various specialist telescopes. For the nighttime show the resident astronomer meets the group (you have to pre-book) at the St Luc/Tignousa funicular for a special ride up the mountainside in the dark. Click here to read about our visit. Although not the largest of Valais engineering works, the panorama of the turquoise waters of the Moiry reservoir surrounded by high mountains and with the Moiry glacier at its head are captivating. One of the local Postbuses goes all the way to the barrage, or if you have your own car you can drive right along the reservoir to get up close with the glacier. 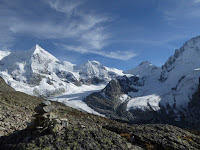 This is a great starting point for hikes around the reservoir and towards the Moiry Glacier or back towards Bendolla/Grimentz or up and over the Corne du Sorebois to Zinal. You can, by appointment, pay a visit to see the engineering works at the Barrage. Normally I wouldn't mention a swimming pool as an especially exciting place to visit, but I've never seen a swimming pool like this one before. This immaculate new pool in Zinal is filled with incredibly refreshing water channeled off the surrounding glaciers and left us feeling blissfully clean and invigorated. But the greatest part is that one entire wall of the building is made of glass allowing swimmers (and loungers) to gaze out over the snow covered 4000m peaks further up the valley. For visitors who want an extra treat you can pay 10CHF to access the spa facilities as well, which we did for Esther's birthday. If you visit Val d'Anniviers in late September then the annual cow festivals held in each of the major villages are a real treat. This annual celebration of alpine grazing involves local farmers decorating their prize cows with colourful floral headdresses and leading them through the streets of the old villages, followed by the rest of the herd. We enjoyed two different processions, one in Ayer and one in Grimentz. The processions are followed up by an afternoon of music, fun and food for all local residents and visitors. Click here to see our photos. In addition to the high mountain beauty at the crown of the valley, the village of Chandolin high above the valley mouth is one of the highest in Europe and also affords spectacular views stretching along the Rhone valley floor almost 2km below. It is also possible to take a chair lift up to Tsape at almost 2400m to extend the view even further and, after just a short hike, reach the Ilhorn at 2716m which opens up the view right over to the Bernese Alps range in the north. Click here to read about our hike.